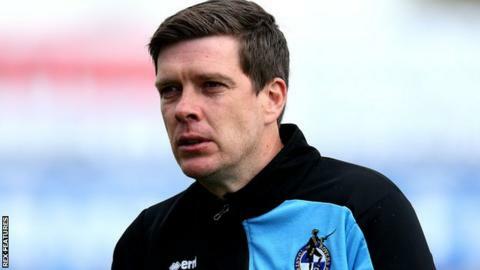 Bristol Rovers manager Darrell Clarke has agreed a new three-year contract to stay at the promoted League Two club. Leeds United made a formal approach to speak to Clarke on Tuesday about taking over at Elland Road, but the Memorial Stadium club turned down the request. That prompted Rovers to offer Clarke, 38, an improved deal at the club, which has secured back-to-back promotions. Rovers say Clarke's new deal will see him become the highest-paid manager in the club's history. "I can fully understand how flattering it is to be approached by a club of the stature of Leeds United, but we're delighted that he's remained with us," chairman Steve Hamer told BBC Radio Bristol. "I was delighted to hear this morning that Leeds had the courtesy to respond to an email, which simply stated that they have withdrawn their interest because Darrell had decided to remain with us." Clarke was in charge when Rovers dropped out of the Football League in 2014 but has guided them up to League One. He began his managerial career at Salisbury City, where he secured four promotions in five seasons before joining Rovers as assistant manager. "I had several conversations with Mr Cellino, who I have to say is a rather colourful individual, and I wish him well with his future search for a manager," Hamer added. MK Dons boss Karl Robinson turned down an offer last week to manage the West Yorkshire club. Current Leeds head coach Steve Evans is still waiting to discover if he will remain in charge at Elland Road.